*A light lunch will be served at 12:30 p.m. Talk begins promptly at 1:00 p.m. Despite his stated commitment to forging a so-called “ultimate deal” for peace between Palestinians and Israelis, President Trump and his administration have not taken any serious steps to do so. On the contrary, Trump has further alienated and marginalized Palestinians by recognizing Jerusalem as the undivided capital of Israel, moving the American embassy to Jerusalem, eliminating humanitarian aid to UNRWA and to Palestinian hospitals, shutting down the PLO delegation’s office in Washington, DC, and by taking other hostile measures. At the same time, the US continues to provide unparalleled support to Israel and its right-wing government lead by Benjamin Netanyahu. Yet, the PLO and PA continue to remain publicly committed to negotiated peace, non-violence, and the two-state solution. Now serving as the head of the PLO mission in the United Kingdom, Dr. Husam Zomlot will provide updates on the latest political and diplomatic developments, and will discuss whether the Palestinian leadership still believes that a peace settlement is possible, and if so, how. Join us for the first conference with Dr. Husam S. Zumlot since he left Washington when the PLO Mission was forcibly closed in October 2018. Dr. Husam S. Zomlot is the Head of the Palestinian Mission to the United Kingdom and Strategic Affairs Advisor to the Palestinian President. 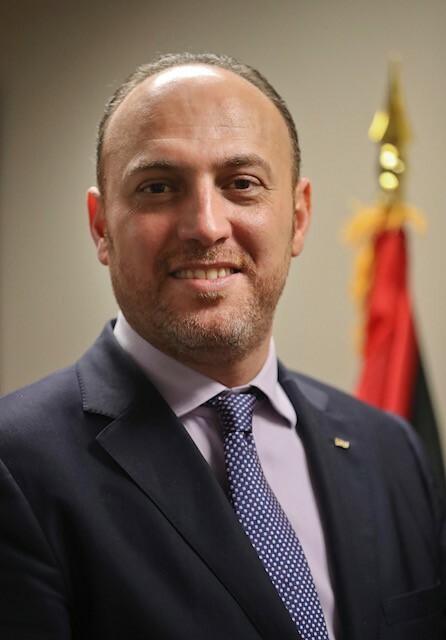 Prior to his appointment to the UK, Dr. Zomlot served as Ambassador to the United States (Head of the PLO General Delegation to the United States). Dr. Zomlot’s previous official roles include serving as Ambassador–at-large for the Palestinian Presidency and Director of Fatah Foreign Relations Commission. Dr. Zomlot holds a PhD in Economics from the University of London. His academic career includes serving as a professor of Public Policy at Birzeit University, where he co-founded and chaired the Birzeit School of Government, and a number of teaching and research positions at Harvard University and the University of London. His professional experiences include working as an economist at the United Nations and as Economic Researcher with the London School of Economics, as well as the Palestine Policy Research Institute.